A fine strike from Jim O`Brien! With the first game ending in a 0-0 draw, the two sides returned to Hampden Park amongst various disgruntled noises from both clubs who had apparently not taken the option to inform the SFA of a preferred alternative venue when presented with the opportunity. 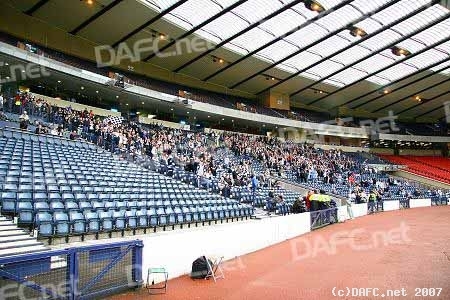 So approximately 3,000 Dunfermline fans returned to the national stadium full of hope that their club could reach their second Scottish Cup final in only 3 years, and only the 5th in the club’s entire history! Stephen Kenny again had to shuffle his starting line up due to players being cup tied and suspended. Tam McManus and Stephen Glass both dropped out having been listed, and inevitably been unused, as substitutes for their former clubs earlier in the competition. Scott Wilson’s booking in the first match saw him pick up a one game suspension that would at least allow him to play in the final should his team mates make it through. Dorus De Vries continued in goals, with the Dutchman aiming to record his third clean sheet in a row against Hibernian. Phil McGuire came back into the side after his SPL suspension and played alongside the recently resurgent Sol Bamba at centre half. Greg Shields stayed as captain at right back, whilst Scott Muirhead was again given the task of keeping Ivan Sproule quiet in the left back slot in which he has excelled recently. Midfield line up consisted of Gary Mason and Jamie McCunnie in the middle, with McCunnie aiming to continue his recent run of form which has suddenly seen him form a solid partnership with Mason and allowed him to play the best football of his career at Dunfermline to date. The two were joined, quite surprisingly, by the returning Darren Young who has been out with injury for months. His one reserve appearance obviously gave Stephen Kenny enough indication that he was ready for a full return, and Young joined McCunnie and Mason in midfield. Wide men were Jim O’Brien and Adam Hammill, with Jim McIntyre up front minus his productive partner McManus. Pars support on the night. Early tussles between the sides failed to carve out any real clear cut chances, but it was already proving to be an end to end encounter, with both teams clearly looking to win the tie which had to be settled on the night, one way or another. After a couple of half chances at each end, Phil McGuire was taken by surprise as the best chance of the match to date fell to him after 19 minutes. (Dodgy) keeper Andrew McNeil saved a Jim McIntyre header only to parry the ball into the path of the free McGuire inside the six yard box. With no time to control the ball, McGuire pushed the ball towards the gaping goal with his leg only to have it cleared off the line by the very well positioned Stevenson who remained at his post. At the opposite end, De Vries was tested by a couple of long range efforts which could have provided more trouble had they dipped at an earlier time, however they were easily touched over the bar for corners. Hibs upped the pressure to a certain extent as the cup tie headed for half time, however the teams were both deadlocked at 0-0 as Craig Thomson blew the whistle for the interval. Darren Young v Scott Brown. Both recent matches against Hibs have seen early substitutions made, and Hibs continued the trend at half time, though Stephen Kenny elected to keep his same eleven as Dunfermline kicked off the second half. Gary Mason was unfortunately involved in a late tackle on Steven Whittaker, which was his second yellow of the competition having been booked against Partick Thistle in the fifth round. 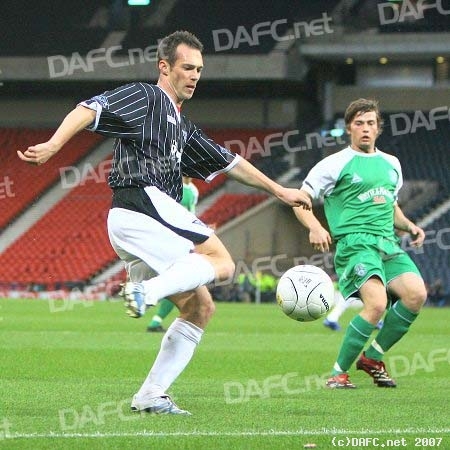 Mason, one of two survivors of the 2004 cup final team along with Darren Young, was therefore going to miss out on the final should Dunfermline win through on the night. It was a sore one for Mason to take, but he never appeared to let it get to him, as he carried on in his tasks for the rest of the game. Hibs began to turn the screw as the second half progress, with Dunfermline seeing much less of the ball and relying on the defence to keep them at bay, which they did with remarkable ease to be honest. De Vries was rarely called upon, and when he was required he was up to the task. His only one minor slip came when a Scott Brown shot had the pace to squirm through De Vries’ save, only for Jamie McCunnie to be perfectly placed at the back post to boot the ball to safety when it looked to be rolling into the net. Another Hibs sub, Dean Shiels , added some pace to their attack and he caused Bamba, and the Dunfermline support, a heart fluttering moment as the two tussled going into the box. Shiels was the first to go to ground, perhaps too keen to do so, and the referee Thomson waved play on.